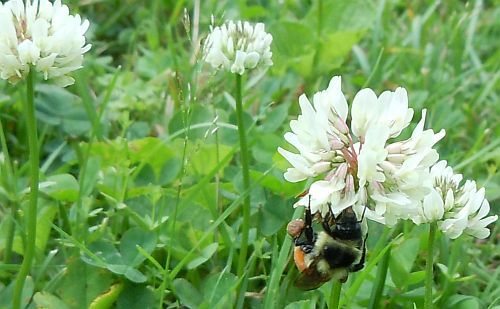 The lawn is laden with clover this week, offering an all-you-can-eat bumblebee buffet. The bumblebees’ activity is so quick and their movement so constant (they’re as busy as bees you know) that almost every photograph I took of them was blurred. It was also a challenge to not step on the bees as I attempted to photograph them while they worked. As they travel from clover floret to floret seeking nectar, female worker bumblebees fill the pollen baskets on their hind legs. By the time these baskets are considered full by the bee, each might contain up to a million grains of pollen. Imagine the care and hard work required to gather so many grains! This pollen will then be carried home to feed the next generation of bees. Due to their long tongues, bumblebees are the insects most capable of reaching the nectar hidden within the folds of the clover floret. 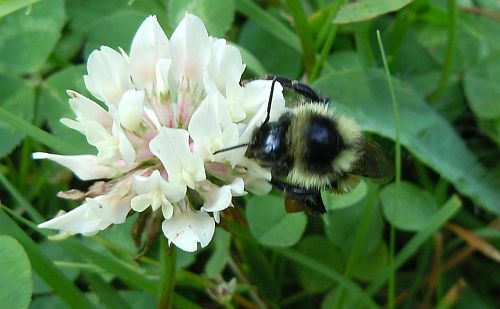 Bumblebees pay for the pollen grains they gather by cross-pollinating the many clover florets they visit. They’re hairy little creatures, magnets for any pollen they encounter as they go about their busy work. Later, back at home, they’ll use special combs on their legs to carefully clean off any pollen that’s left lingering on their bodies. This is a beautiful post, so lovingly written. Bees and bumblebees are the most amazing creatures; without their diligence and hard work, we would not be able to survive. I wish we could protect them more. 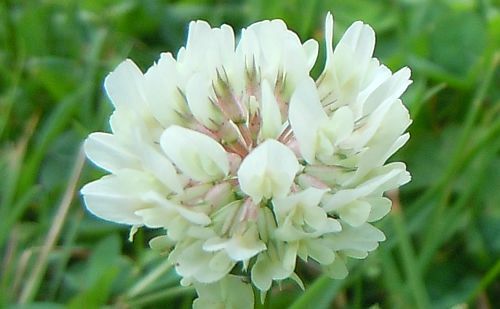 Isn’t it amazing how complicated a single clover is? Well, being a collection of smaller, complicated flowers. I sense you feel as I do about the hard work bees do. And where would we be without them? Late yesterday afternoon I took my dog for a walk down along the little creek here in the village, and on the other (sunny) side of the road the milkweed were humming with bees. I was just admiring a bee on a stalk of clover today. Great minds think alike ! Amy-Lynn, thank you for writing this post. 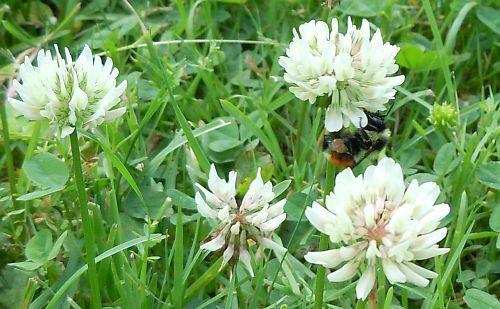 I have been closely watching the bees in the clover and idly even thought of blogging about them, too. (However, didn’t.) We have so many bees buzzing about this year. Yet, we know that world-wide that isn’t the case. This reminded me about our terribly cold & harsh winter this year. People around here scoff about global warming. Yet we must remember that just looking at one microcosm can be so insular when we’re thinking of the health of the planet. Isn’t nature and its inhabitants wonderful ? I so admire these hardworking bees which are vital for humanity. Your pictures and words are a beautiful tribute to them, thank you.